What would you do if your child came home with a D-minus? He’d probably have some explaining to do. Thanks to a recent study by the Institute for Justice, law enforcement agencies across the state need to be called into the principal’s office. The study analyzed the state’s civil asset forfeiture laws, whereby police can seize your property even if you are never convicted—or even charged with—a crime. 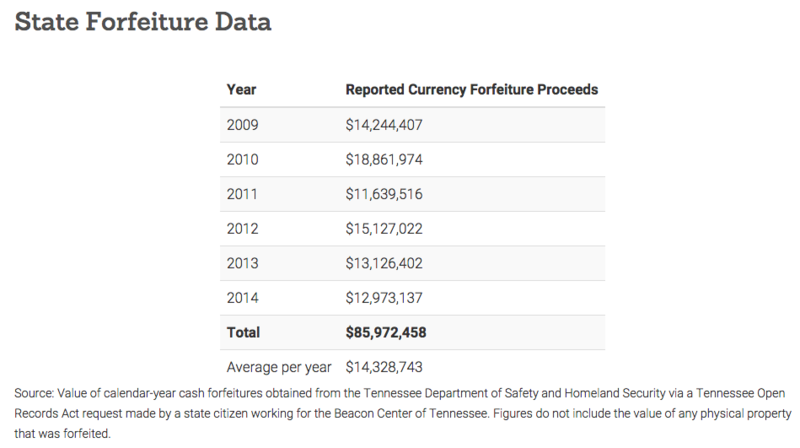 The study calls Tennessee’s civil forfeiture laws “appalling” and for good reason. First, police need a mere preponderance of the evidence to seize your property, which could include cash, your car, or even your home. Yet, they never have to prove to a judge or jury that you committed a crime. In fact, the burden is on you to prove that you didn’t commit a crime in order to get your property back. So much for innocent until proven guilty. How much do law enforcement agencies seize each year in the Volunteer State? It’s hard to say, because there is a dearth of reporting requirements for seized property. We only know that the state Department of Safety and Homeland Security takes in an average of more than $14 million per year in cash alone. 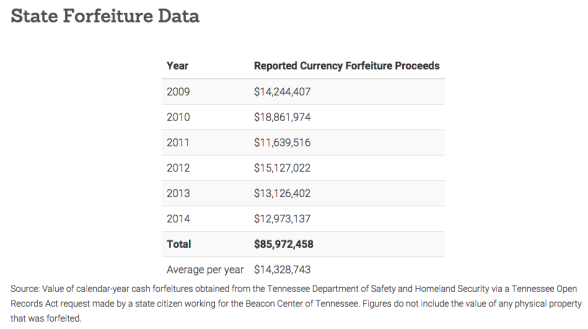 Since 2009, agencies have seized nearly $86 million in cash through our civil forfeiture laws. Who knows how much non-cash property was seized during that time period. Fortunately, groups across the political spectrum are banding together to stop this nonsense. This is not a matter of Right versus Left; it’s a matter of right versus wrong. Both the Beacon Center and ACLU have fought to reform our civil forfeiture laws, ensuing that innocent Tennesseans are not victimized by this practice. And the new report from the Institute for Justice only proves that this problem is worse than we even imagined. When lawmakers return to Nashville in January, ending policing for profit should be at the top of their list. 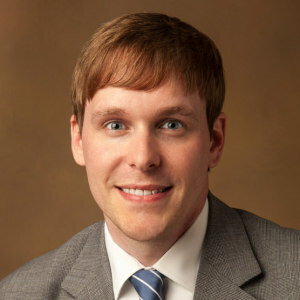 Tennesseans who value their property and civil rights will thank them.